Freeze-dried ready to eat neapolitan ice cream. Enjoy your ice cream just as the astronauts do - the freeze-dried way! 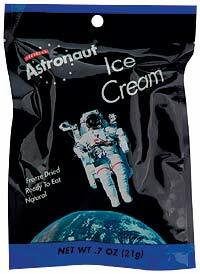 Astronaut Ice Cream, as well as other freeze-dried food items, have been aboard space missions since the early Mercury missions. They continue to be used on NASA missions today.